- FREE dinners 3 times a week - pasta, tacos, curry - wholesome & made with love! Green Tortoise has been the favorite of backpackers and travelers for decades. People rave about our unbeatable location in historic North Beach... just a few steps to San Francisco favorites like Chinatown and Little Italy, and a quick walk to Fisherman's Wharf and Union Square. After participating in our nightly activity, such as our famous Pub Crawl or Beer Olympics, you can get comfortable in our funky dorm rooms or cozy private rooms and enjoy our delicious free meals. If you have the time, hop on our “hostel on wheels” for a famous Green Tortoise Adventure Travel trip to Yosemite, Baja, Alaska, Burning Man, and other US National Parks! These are just a few of the reasons the Tortoise has become a legend. *Some colorful adult entertainment clubs are located in our vicinity, also a busy & noisy area on the weekends and in peak season from clubs on the street. If you're looking for a sterile, dull hostel that you can forget about the moment you leave San Francisco, the Tortoise isn't it. 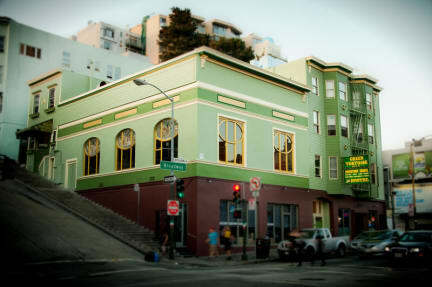 Time after time, our guests tell us that their favorite memories of San Francisco are of the times they spent in the hostel itself, meeting and hanging out with other backpackers, enjoying nights in our ballroom, making friends while enjoying our free dinners (3 times a week), or dancing in the ballroom until all hours. If the sun comes up before you've gone to bed, you know you've had a good night at the Green Tortoise. To make it like your home, there's no curfew, huge kitchen, giant common room with a pool table and foosball, piano, stereo, bicycle rack and quiet places to fill in the journals of your travels. The rooms are all non-smoking with large lockers under the bed to store your gear safely, comfortable beds with reading lights & 4 individual outlets per bunk, and new friends to meet. Our private rooms give you a real home away from home feel with comfy beds so you can chill out and have quiet time with your travel mate. Visit more of California and travel across the United States with the Green Tortoise Adventure Travel, located inside the Green Tortoise Hostel, stop in and see where you can go in style in our legendary 'Hostel-On-Wheels' Sleeper Coach Bus Trips. Take trips to Yosemite, down the Cali Coast, Alaska, Baja, Burning Man, and across the USA! Check us out online for a complete list of adventures & trip dates for 2016-2017. I had a great 2 night stay here. Very clean, very welcoming atmosphere, excellent location, great people. Amazing! Definitely one of the best hostel I’ve ever stayed in! Great location to explore, nice atmosphere, super friendly and cool staff, delicious free breakfast with bagels, fruits, eggs etc. and just a great overall experience - would 100% stay again! Imma be back guys!! I had a great time here! Everything was very clean. The staff were incredibly friendly (especially Melissa), and really went out of their way to make sure that travelers got everything they needed whether it was socializing, directions, or food. I highly recommend staying here! It’s a nice hostel, the staff is really nice, the food is good, the location ist also very good because it’s close to everything. The only thing is the noise in the night, it can be pretty loud on the streets, but all in all it’s fine. Amazing hostel, with lots of free stuff, like free dinners every second day, sauna, live music and other offers that can help you keep your budget low. Facilities are very atmospheric, pretty clean and excellent location. There is a very interesting nightlife around this area, with historic bars and cafes, live music, karaoke and more. We even extend our stay for one night and definitely we ll choose this place again if we ll be back to SF. It was a bit shocking to me when I woke up in the middle of the night seeing that a German Shepard was sleeping in the lower bunk bed with his/her owner. I am not saying I do not like dogs. I have two Yorkies at home. If a dog is going to be in the same room as me, I would like to know in advance. When 8 people share a room with a dog, the smell was quite incredible not in a pleasant way. Whether it is a service dog or not, I did not enjoy my stay at the hostel due to lack of transparency. Rather disappointed with this hostel. The staff were very unhelpful - forgetting to give me keys, not knowing anything about the local area or the tours being offered, general blasé attitude towards clients. There’s lots of renovation work happening too at the moment, with fresh paint down corridors and bathrooms (which are few and far between), being closed down.